While it might not be the best know of all the available deposit methods for online roulette, Instadebit is growing in popularity among Canadian players. Anyone in Canada who is familiar with other e-wallet banking alternatives should have little difficulty using Instadebit, and it can be used for more than just real money online roulette deposits. The number of online roulette sites accepting Instadebit is growing, and some of the best roulette casinos on the internet are making it easy for players to add real cash to their account using this banking method. How do Instadebit deposits work? As with other e-wallets that you can use for online roulette, Instadebit will show up alongside other deposit methods in your chosen online casino's cashier. But before making a real money casino deposit with this method you need to first fund your Instadebit account. Once you have set up an Instadebit account, which shouldn't take too long, you can fund it directly from your internet banking account. Once that is done, head back to the casino site and click the Instadebit logo in the cashier. You will be asked to choose the deposit amount and provide details of your Instadebit account, after which you can start playing for real cash in next to no time. Multi-currency: Instadebit supports Canadian dollars as well as other major world currencies such as the US Dollar, British Pound and Euro. No additional fees: When making a deposit to play roulette, Instadebit will not incur any additional charges, unlike some other deposit methods. Withdrawal: Some deposit methods for Canadian casinos require you to use a different method to withdraw your winnings, but roulette casinos accepting Instadebit will also allow you to make withdrawals to your Instadebit account, which will normally be processed within three days. Security: Everything on the Instadebit banking system is fully encrypted, ensuring your privacy remains intact and protecting your money. When making real cash deposits to play roulette, Instadebit offers that comforting knowledge that everything is as safe and secure as it can possibly be. When using Instadebit to deposit with an online roulette site from Canada, you can just provide the casino with details of the e-wallet account, rather than giving them any additional personal information. This can offer Canadian roulette players peace of mind, particularly if they are hesitant about giving away personal details to an online casino. While you may be new to online roulette, Instadebit may be more familiar to you from using the e-wallet system to make other online purchases. If in doubt, having minimal details of your Instadebit account stored on an online casino's system can be preferable to having sensitive personal info stored there. The large number of roulette sites accepting Instadebit means that the options available to Canadian players will be extremely diverse. With that in mind, it can help to have more experienced roulette players do some important research for you. Our team of reviewers has a great deal of experience in the world of online casino games, and many have made multiple roulette Instadebit deposits in the past as well as using this and other deposit methods to play great casino games on a wide range of top rated sites. If there is anyone better placed to offer advice on which roulette casinos accepting Instadebit are the best, we haven't met them. Instadebit is a third party processor that is making it possible for Internet gamblers to play internationally. While Canadians will find great comfort in this enterprise, their comrades to the South are not so lucky. 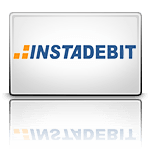 Instadebit is, as the name implies, instant debit transactions through a third party source. If you have used any of the more popular eWallets, you will not be disappointed with this seamless approach to online casino Roulette. Instadebit works very much like an eCheck. Because it utilizes an electronic funds transfer protocol, it allows you to connect your bank account to your Instadebit account. eChecks work just as if you were writing a check at a local supermarket. The primary difference here is that as long as you have funds in your bank account, then there is no waiting to get your check to clear before moving forward in the line. Plus, the transaction with the casino is completely autonomous, your private banking information is protected, and the bank isn't informed as to where you are writing a check. That is between you and Instadebit. Most definitely! Instadebit is accepted at many online casinos that provide service to Canadian online casino lovers. It is available in Canadian currency as well as currency from around the world. Our team of experts have searched many online casinos that both accept Canadian Roulette players and Instadebit. Fortunately for you, they have applied over 20 years of online casino experience, and as a result they have found the best of the best. Instadebit is a very safe and reliable eCommerce method of deposit and withdrawal. Because it utilizes 128-bit SSL encrypted protocols and data encryption of your personal information, it has met all safety regulations necessary to be deemed safe and secure. When it comes to deposits into your online casino account, the transfers are immediate. In no time at all you can sit down to a table and start spinning and winning. As far as withdrawals go, although they are very fast, you must have established a good account record with Instadebit prior to being able to use Instadebit as a withdrawal tool. This is not on the online casino, but a stipulation of Instadebit. Instadebit is very comparable to other eChecks, eCommerce, and third party processors. The speed, privacy, security, and low cost approach to online transactions are found through Instadebit. There are nominal charges for transferring funds and for receiving funds from other sources. But the charges are some of the lowest in the industry.